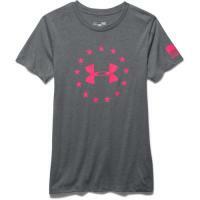 This short sleeve women's t-shirt is part of Under Armour's UA Freedom line-up, which supports the company as it donates over $250,000 each year to support law enforcement officers, first responders, military personnel and veterans. It is made from the Charged Cotton tri-blend fabric, which includes cotton, polyester and rayon for a soft feel with superior performance. It includes the signature Moisture Transport System, which wicks sweat away from the skin to leave you dry and comfortable. Anti-odor technology kills off odor-causing bacteria, preventing that "locker room" smell, and the fabric also includes built-in stretch for enhanced mobility.